Surface Inspection Techniques Using the Integration of Innovative Machine Vision and Graphical Modelling Techniques brings together novel concepts in machine vision, computer graphics, and three–dimensional modelling, in solving real practical inspection problems. Automated inspection of three–dimensional shape and the analysis of both two– and three–dimensional surface defects and texture patterns, represents one of the most challenging and rapidly developing applications for machine vision today. This is the first book to include a comprehensive review of exisiting techniques for defect detection. It goes on to develop a new approach to the problem of shape analysis, surface inspection, and texture classification. A simple, low–cost demonstrator system is described. Using a fixed camera and fixed computer–controlled illumination system, this innovative approach offers potential for new applications, considered to be beyond the capabilities of existing inspection techniques. A thorough treatment of underlying theory is given, including sufficient detail to allow application to real inspection tasks. Numerous example applications are discussed across several industrial sectors. Surface Inspection Techniques will appeal to practicing engineers and scientists, as well as undergraduate and postgraduate students, offering a better understanding of the theory and practical applications of image processing and computer graphics in surface inspection tasks. 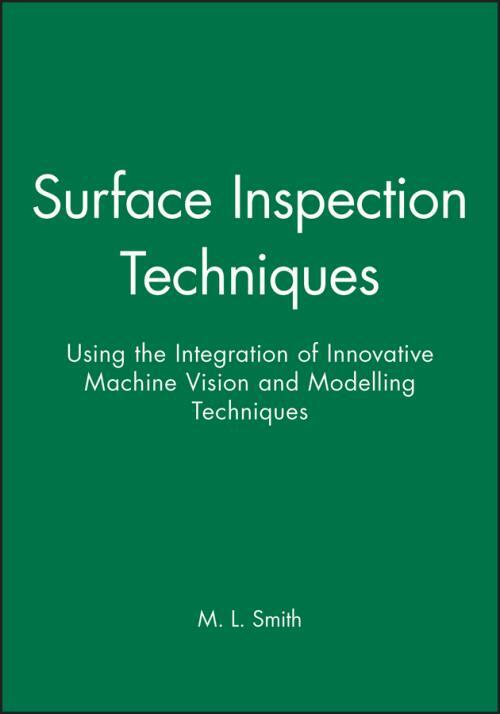 Manufacturing engineers and inspection system developers, quality engineers, and anyone requiring an insight into the complex issues invovled in automated surface inspection will find this book useful. 1.1 An absence of automated surface inspection. 1.2 The nature of surface defects. 1.4 The need for flexibility. 1.5 An overview of the book. Chapter 2 Automated Surface Inspection. 2.1 Application of machine vision to surface flaw detection. 2.2 Surface defects in the presence of a complex background. Chapter 3 An Alternative Surface Description. 3.1 A new surface model. 3.2 The Gaussian image and the extended Gaussian image. 3.3 Structural defects as a shape aberration. 3.4 The bump map as a topographical description. 4.2 Surface albedo and surface normal recovery. 4.3 Three–light coordinate frame photometric stereo. 4.4 Consideration of color photometric stereo. 4.5 Consideration of specular reflection. 4.6 Adaption of conventional methods of image analysis to the acquired bump map. Chapter 5 Reconstruction of Acquired Surface Detail. 5.1 Generation of synthetic images. 5.2 Reconstruction of the surface depth map. 6.1 Aims of the experimental work. 6.2 Construction of the experimental apparatus. 6.4 Presentation and discussion of results. Chapter 7 Analysis of Surface Defects. 7.3 Distribution of surface shape as a new alternative. 7.4 Shape as a hierarchical structure. 7.5 The gradient space domain. 7.6 Independence of object pose. 7.7 A generic surface inspection strategy. 7.8 Classifying defects from spatial and gradient plot signatures. 7.9 A measure of distribution. 8.2 Analysis of surface structural texture. 8.3 Defect upon a cosmetically sensitive polyhedral component. 8.4 Isolation of bump map from surface geometry. 8.5 The classification and quantification of surface defect features using the ellipsoidal model, in the case of an unconstrained specimen. 8.6 Summary of the experimental work. Chapter 9 Example Case Study Applications in Industrial Machine Vision Surface Inspection. 9.2 Alphanumeric character recognition on gas turbine blades. Chapter 10 Overview of a Generic Inspection System. Chapter 11 Conclusions and Future Work. Appendix 1 Technical Papers Arising from this Work. Appendix 2 The Four Stages of Machine Vision. Appendix 3 Perspective and Orthographic Projection. Appendix 4 A List of Programs. Appendix 5 Validation of Blob analysis software using Synthetic Scratches and Method of Moment Analysis. Appendix 6 An Approximation of Feature Depth from Spatial and Gradient Distributions. Appendix 7 Ellipsoidal Feature Width Using Method of Moment Analysis. Appendix 8 Calculation of Principal Dimensions of a 2D Feature Given Only Area and Perimeter. Appendix 9 Selected Experimental Results. Appendix 10 Altering the Light Source Position.